If you’re the kind of person that has so many appointments to keep track of that it’s actually better for you to keep track of them all in a chart rather than a calendar, then a new Web app from Tom’s Planner called Ganttify might be right up your street. 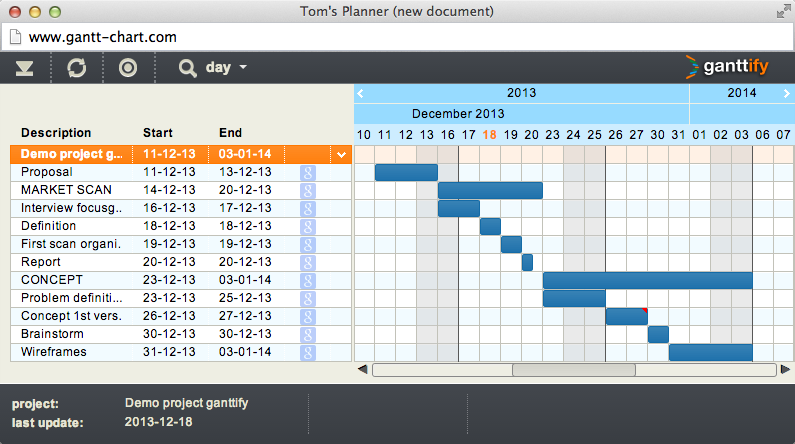 The Web app, announced today, is the first product to result from Tom’s Planner’s purchase of Gannto in July last year and will remain free to use for six months. From July 2014, it will cost $29 per year. To get started, all users have to do is log in with their Google Calendar, Basecamp or Trello details and then authorize the tool to access the calendar information. Once that is taken care of, a chart can easily be created by clicking the button next to the calendar you want to transform. As well as viewing it on screen, the charts can be exported in picture or PDF format, making them easy to embed in other documents. By the end of February, the company aims to have added iCal and Outlook support for the tool too.